The blood thinner Xarelto and other anticoagulants caused more than 3,000 deaths in 2016, according to a recent report by the Institute for Safe Medication Practices (ISMP). Its QuarterWatch indicates that nearly 22,000 adverse event reports were sent to the FDA last year about anticoagulants such as Xarelto, Pradaxa, Eliquis, Savaysa, and warfarin. Most of those adverse events were linked to bleeding. Of these, 3,018 were fatal. QuarterWatch’s cover highlights the anticoagulants as the “top risk for acute injury from drugs.” The report also cites “unacceptably high risks” from blood thinners. Almost half of adverse events triggered by blood thinners were severe in 2016, with patients requiring a stay in the hospital. Bleeding issues with Xarelto were the most frequent. Over 68% of the adverse events reported were specifically linked to Xarelto. Eliquis, the second most common, caused just over 14% of the adverse events. QuarterWatch noted that the frequency could stem from 1) the widespread use of Xarelto and 2) the fact that a number of the adverse events occurred before 2016, but were only reported last year. 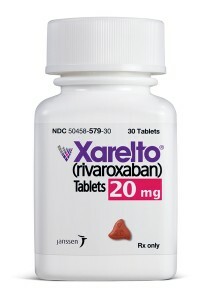 Xarelto (rivaroxoaban) is one of a new generation of innovative oral anticoagulants. It was rolled out in 2011, and marketed as an alternative therapy to Coumadin (warfarin), which long enjoyed the status of standard anticoagulant on the market. All blood thinners have the potential to cause bleeding. But there is a commonly known and widely available antidote for warfarin. There is none for Xarelto or any other drug of its class. It became apparent that Xarelto could cause uncontrolled bleeding that could not be reversed. Over 18,000 Xarelto lawsuits have been brought against Bayer Healthcare and Janssen Pharmaceuticals, the makers of Xarelto, for damages from severe and uncontrollable adverse bleeding events when patients were given the drug. In addition, the suits allege that both drug makers did not sufficiently warn either the medical community or patients about the fact that no reversal agent existed. Because the suits concern similar questions of fact and law, the federal cases have been consolidated before U.S. District Judge Eldon Fallon in the Eastern District of Louisiana, as part of a multidistrict litigation (MDL). Pradaxa, a similar medication, was rolled out prior to Xarelto’s launch and was the focus of similar lawsuits. Pradaxa’s manufacturer ultimately settled with claimants just prior to the first set of consolidated bellwether trials, for a total amount of $650 million, or $150,000 per claim on average. Because of Xarelto’s wide use, the number of suits is expected to be higher than the number of Pradaxa claims. Have You Been Injured by Xarelto?